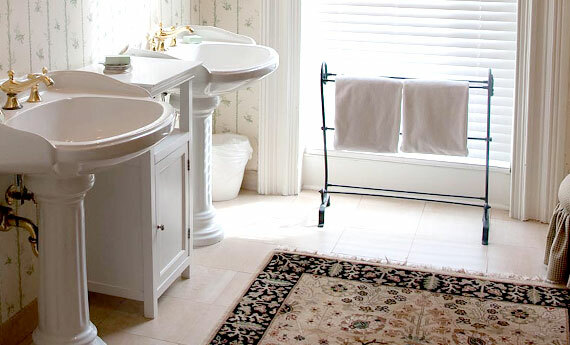 A vintage style bathroom with matching pedestal sinks has Daltile's Briton ceramic floor tile in Bone featuring a color variation reminiscent of the look of natural stone. The bathroom tile has a neutral color and cool, smooth finish illustrating a comfortable elegance in a small bathroom design. Moreover, the ceramic tiles durability and abrasion resistance also makes this tile suitable for walls and countertops. 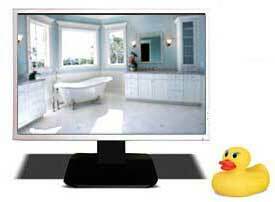 software, bath planners, paint apps, online room design, virtual room designer.